Generators are relatively simple machines. In fact, they work much like your local electric power plant, but just on a much smaller scale. Power plants burn fuel, like coal, to spin turbines that generate electrical power; while generators burn fuel like gasoline, propane, natural gas, or diesel to power engines that produce electricity with the help of an alternator. Portable generators are the perfect solution for you if you need a unit you can move easily. These generators are a popular means to provide power to areas with no access to the electrical grid. Campers and tailgaters regularly use small hand-held generators to meet their electrical needs when enjoying the great outdoors or gathering to cheer on their home team. Larger portable generators are often transported by trailer or pickup trucks to places like construction sites and outdoor events to get the job done. These handy generators are becoming increasingly popular with homeowners who want a reliable power supply to help them weather intermittent power outages. While portable generators offer a great solution for weathering the storm during brief power outages, standby generators are designed to protect your home and your business from the personal and financial losses that can ensue from prolonged power outages. These generators are permanently mounted and are meant to be used as a reliable backup supply of electricity for your home or business whenever your regular power source is down. They are generally fueled by natural gas or liquid propane and programmed to automatically start/stop routing electricity into your home or business when needed. While portable generators offer enough juice for your camping trip and tailgate party, if you are planning on traveling in style aboard your recreational vehicle (RV), you’ll want to use an RV generator. These generators are specifically designed to power your RV appliances along with all the accessories you are used to enjoying in your recreational vehicle. RV generators are permanently mounted on your motorhome, trailer, or fifth-wheel, and they run on gasoline, liquid propane, or diesel fuel. Remember how generators are essentially engines that produce electricity with the help of an alternator? Well, Power Take-Off (PTO) generators are designed to produce electrical power on farms and ranches, where most people already own powerful engines in their tractors. Therefore, PTO generators are basically just fancy alternators that can use a tractor’s engine to produce electricity. What criteria should I consider when purchasing my generator? Once you have decided what type of generator you are looking for, your next step is to familiarize yourself with some fundamental criteria that will enable you to make a final decision about the specific generator that is just the right match for your needs. As you consider your needs, ask yourself: do you need a large, stationary unit, or do you want something portable? A portable generator is a liquid propane, natural gas, or diesel-powered device which is easily movable and provides temporary electrical power. Construction contractors use portable generators to power tools and lights at a remote site. Campers and tailgaters may use a portable generator to power TVs, crock-pots, blenders, etc. Most commonly, residents and businesses left without power after a weather event will use a portable generator to keep vital appliances operating. These devices usually have enough power to keep a freezer, refrigerator, television, and some lights working. These large, industrial generators are used for construction sites, outdoor events such as carnivals and concert venues, and other places where lots of power is needed. They often run on diesel fuel and are mounted to a trailer for towing. These are large generators permanently mounted outside of businesses or homes in order to be used as a backup power source during outages. They often run on diesel fuel, natural gas, or propane. You certainly want to know what wattage your generator should offer to fulfill your needs. This means knowing what you want to power and how much wattage those items need to start (starting watts) and run (running watts). Keep in mind that the wattage required for starting a tool or appliance with a motor will be much higher than the watts required to run that device. Maximum power is the maximum output that a generator can produce. Your generator will usually only be able to maintain this output level for up to 30 minutes. Rated power is the power that a generator can produce for long periods of time – typically 90% of the maximum power. To determine the best size (power rating) generator for your needs, just add up the wattage needed for each device you want to power simultaneously. Or use each device one-at-a-time with a smaller generator. Most electronic appliances and devices have this listed on a label affixed to the unit. You can run extension cords from your generator into your home or business. Alternatively, you can take a safer route and have an electrician install a transfer switch in your property’s electrical panel and apply the power from your generator into your circuit breaker. Standby generators are installed outdoors. The electricity they generate is routed from the unit and into your home or business via a transfer switch. If you want your generator to run through your property’s electrical wiring, then a transfer switch is a must. The transfer switch works similarly to your home’s thermostat. When your power goes out, your automatic transfer switch senses it and starts your generator; when normal power is restored, the transfer switch automatically stops the generator. When you select your switch, you will want to choose the amps that match your home’s main breaker. There is also more than one type of switch installation from which to choose: standard, load center, and service disconnect. Standard: This is an older form of switch and installation. It is ordered and installed independently of your generator and subpanel. And since generators and switches now come in bundles, electricians often avoid working with these. Load Center: This type combines the switch and the subpanel. It is an easier installation for your electrician, as he only needs to install the load center into the essential circuits. This is particularly useful for small home standby generators that require a lower amp service. If you need to power more than one air conditioning unit, load centers may also offer AC Shedding, which is required for that purpose. Service Disconnect: You can also get your switch with a service disconnect, which is optimum if your home needs more power. It is more costly because your electrician will have to install it between your panel and your meter. However, you won’t need to buy a subpanel. This type of switch may also come with AC Shedding capabilities should you need to power two AC units at a time. Newer style generators use inverter alternators which add additional digital electronic circuitry on to the alternator to maintain a steady output voltage regardless of load. Generators that use inverters combine the alternator and the engine into a single, lightweight unit. The electronic inverter circuity allows the engine to automatically throttle itself up and down depending upon the load applied. This results in a quieter-running generator that is more fuel efficient – especially with less demanding loads. The super-clean voltage output by this type of generator is well suited for running modern devices such as computers, video games, flat panel TVs, or any device with a microprocessor. In addition, inverter generators provide both alternating current (AC) and direct current (DC) power. Consumers can use them to power today’s modern appliances as well as to charge their car battery – very convenient! Your fuel and tank will determine your generator’s power and how long it will run on that fuel. So, find out what size fuel tank and type of fuel you need for what you want to accomplish. Natural gas is unlimited, which means no refueling. It also burns clean and is environmentally-friendly. Liquid propane also burns clean. In addition, it is easily kept in small containers and can be stored safely for a long time. Diesel is a less flammable fuel. It also has the benefits of being readily available and somewhat less expensive than other fuels. Gasoline is the most readily-available fuel source. It’s cheap and easy to store and carry; though it does not last as long. Most portable generators run on gasoline and other fuels, and some are multi-fueled with controls that allow switching from one fuel to another. These units are large, heavy-duty, stationary systems that generally function with engines fueled by diesel, natural gas or propane. Standby home generators are installed outdoors and usually run on natural gas or propane. RV generators run on fuel and you want to choose the one most compatible with your needs. For RVs powered by diesel, for example, you may want to go ahead and choose a diesel-powered generator so that you can depend on only one type of fuel during your trips. Of course, diesel is also cleaner and more powerful than standard gasoline, not to mention safer. Liquid propane is also a good choice if you are concerned with the environment. And it has the added benefit of lasting longer in storage. However, it often does not last as long as other types of fuel. Standard gasoline is popular because it’s cheaper and readily available. However, gas is more unsafe and does not last as long as diesel. So, it’s important to decide how much monetary costs means to you in these cases. Section under development. Coming soon! The maximum time a generator can run before needing to be refueled is what manufacturers call run time. It is determined by the load applied, the efficiency of the generator, and the size of its gas tank. Manufactures may provide the run time for both 1/4 rated load and full rated load, however some provide only the run time for 1/4 rated load because it appears much more impressive. Your run time may vary significantly from manufacturer published specs due to the load draw. Remember, inverter generators will automatically throttle up and down when in use dependent upon the load, so consider the published specs a rough guideline only. This is the weight of the generator without gas in the fuel tank. A U.S. gallon of gas weighs slightly more than 6 lbs. Not much additional weight on small, compact generators, but this can add an additional 20lbs to some of the larger 3,000w models. Your unit needs to have plenty of outlets to accommodate all the objects you want to run. Find out what accessories you need to run your generator—cords, transfer switches, extra electrical panels, fuel tanks—and ask yourself if your site can accommodate them. Make sure you follow all city and neighborhood codes for power, installation, noise, etc. Generators of every type are common in towns all across the United States, but that doesn’t mean they can’t be a nuisance sometimes, particularly when it comes to noise. In fact, your neighborhood or city may have noise regulations that your unit will need to conform to. 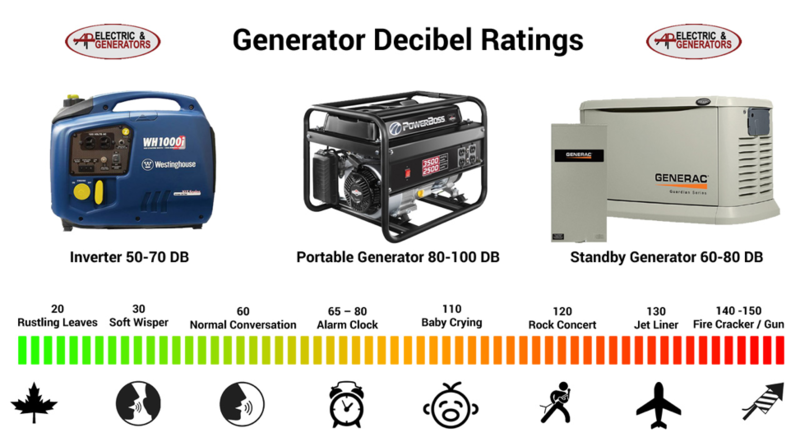 Find out how loud your generator will be in decibels, and compare that to any local regulations your location may have. Manufacturers that provide noise level data usually report it in decibels (dBA), as in “59 dBA”. Sometimes, noise data can also be reported as a range, as in “53 – 59 dBA”. When a range of numbers is given, it means the noise level at 1/4 rated load and the noise level at full rated load. Beware, some manufacturers advertise how quiet their generator performs using only the 1/4 rated load number. So, be sure to evaluate your generator at FULL rated load – that’s when it produces the loudest noise. The table below shows how common noises compare to each other with respect to dBA levels. Keep in mind that the distance away from the sound source directly affects how loud it sounds. Most popular 1,000 – 2,000 watt inverter generators generate 50-60 dBA noise level at full rated load and are considered to be about as loud as normal conversational speech. Because a portable generator uses a combustion engine to generate electricity, it must have several regulators on board. The engine must turn at 3,600 RPM in order to generate the standard 60hz of alternating current in North American homes/appliances. In order to control engine speed, a generator uses a 'governor' which mechanically keeps the engine from spinning too fast. A voltage regulator also keeps the output at 120 volts, which keeps electric motors from burning out. This safety feature prevents errant sparks from occurring and is especially important when camping in dry wilderness areas where fires easily spread. Need more power? Combine two generators together for nearly double the power. This is an additional benefit of inverter technology and is a great way to get more power without sacrificing portability. Found on some models, this feature protects the generator by shutting off the engine when low oil is detected. Protects the generator from being overloaded by shutting off the AC power output if the load draw is excessive or a short occurs. Most models have DC circuit protection as well and will stop the DC output when charging a battery if a problem occurs. Is a small manual valve used to control the flow of gasoline. Its purpose is to reduce carburetor contamination by turning off gasoline flow and allowing the carburetor to run dry. Just flip it to the OFF position to stop the generator and you’re good to go. A bigger opening mounted directly on top makes it easier to fill the tank with less spills. You want your generator to last, and there are some accessories to add during installation to help it do so. Though generators come with a base, it is recommended that you purchase a pad to raise your unit further out off of the ground to keep it steady, level, and out of the dirt. GenPads are made of cement and come with bolts to keep your generator firmly bound to the pad. When you install your unit, you will also want to consider getting a lift gate service to lower the generator from the truck to the ground safely. If you live in an area where the weather gets particularly cold, you’ll want to invest in a Cold Weather Kit to protect your generator from the weather. It prevents the oil from freezing and changing consistency, and it keeps your battery warm. Your generator needs a battery to function and you want a fresh one from day one. Your battery jumpstarts the unit so that you don’t have to do it yourself. This is a generator attachment that allows you to monitor your standby generator anywhere, anytime, and comes with alerts so that problems get immediately addressed. Commercial and industrial generators are built to suit your business’s individual needs. So, it is particularly important to know your requirements and limits. Choose according to the proper voltage in your electrical panel. The best method is to choose according to your incoming utility voltage. You may need a step-down transformer to convert the incoming voltage to the amount that matches what the utility company provides, and an additional electrical panel to properly distribute the power to your business areas. A large home or a smaller business may be able to use a single-phase generator. These generators produce the same amount of volts as the utility company (240), and are efficient enough for smaller businesses that only power electronic devices as opposed to industrial machinery. If you run a particularly large business and your utility company supplies more power, then you may need a three-phase generator. These are best for big businesses, like a manufacturing plant. Never try to install your generator into your house’s wiring. Hire and electrician to connect your unit with an automatic transfer switch and install the generator. This protects you, your home’s wiring, and power company employees working on the lines. Buy and use heavy-duty extension cords to avoid overloading and heat damage. Make sure to arrange them so that no one trips. Be extra careful with extension cords around moisture. Plug your devices and appliances directly into the generator. Don’t run your unit indoors. Your generator needs plenty of ventilation. Add fuel while the generator is off, and never while it’s running. Be careful not to spill your fuel, and never keep cigarettes or other lit objects near your unit. Keep a fire extinguisher nearby. Also, tri-fuel generators help you avoid having to refuel as often. Don’t overuse your generator. Use it only when you need it.